BUILDING POWER – Ten different canvass and phone banking opportunities around the state to build power and unite your neighbors for action in your community. And that’s just in May. See the full events list – with links – on our Facebook page. Why are we doing all this? To fix our broken politics in Maryland by electing people who will blow past the business-as-usual governance style with which way too many officials have gotten way too comfortable. Progressive Maryland has engaged with and endorsed candidates all over the state, at every level. No coin flips here; many of the folks on our endorsement honor roll have answered our detailed questions on the record, and we like what they have to say. Check out their answers. Then get to work getting them elected. Be sure to join us Sunday, May 20th for a panel discussion with the male candidates for the Frederick County Democratic Central Committee. 01:15 PM at C. Burr Artz Public Library – Downtown (Female candidate forum was May 6). 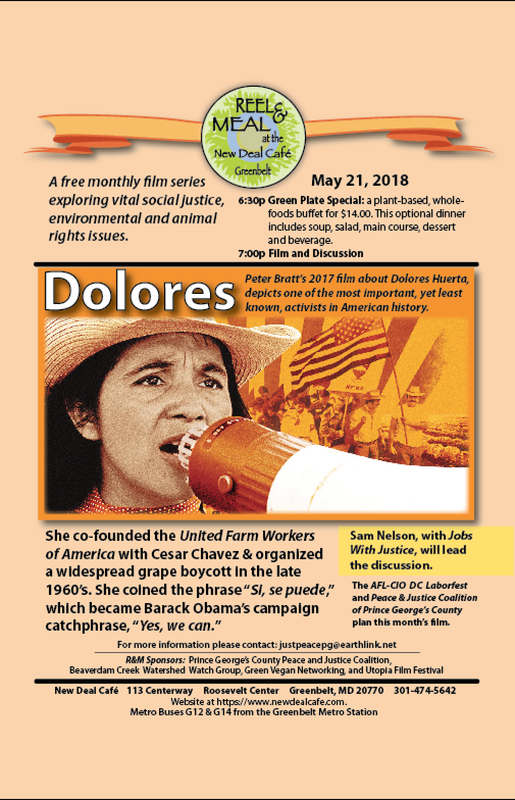 Monday, May 21 -- Part of the LaborFest schedule: The Reel and Meal at the New Deal in Greenbelt shows “Dolores,” the inspiring biopic about Dolores Huerta, co-founder of the United Farm Workers. At the New Deal Café, Roosevelt Center in Greenbelt. Optional vegan buffet meal ($14) at 6:30 and free film at 7, with discussion led by an organizer for jobs and justice in today’s different but difficult environment. TODAY, MONDAY, MAY 7, IS CHARGED WITH EVENTS. So the Weekly Memo is going out early to alert our activists. MORE about the upcoming week will be added to this, our online Memo, as it comes in. Click here to catch up throughout the week.